A teaser from my chapter in the upcoming "Miso for Life--A Melting Pot of Thoughts" anthology. Thanks to Mai Xuan Bui. Book launch in December in Orange County. Frances, I read your book on the plane going home. You are so brave. Such a romantic too! My favorite line: "What would it mean to have you coursing through the arteries of my life?" V3 Digital Media Conference presented by AAJA-LA | Vision. Visibility. Voice. Today is the V3con conference at Japanese American National Museum in Little Tokyo, Los Angeles! Can't wait! V3 Digital Media Conference presented by AAJA-LA | Vision. Visibility. Voice.V3 Digital Media Conference presented by AAJA-LA | Vision. Visibility. Voice. Great interview with our fearless leader, JozJozJoz about upcoming V3con! V3con reception and awards today at Pacific Arts Museum! "I thought I could go to services 9-10 and then cut out quickly to go to the reading from 10-11:30, but there is no escaping the Aunties at temple. The first time we ever went to this temple, they ran out after us into the parking lot and physically pulled the kids out of the car one by one, insisting we stay for lunch." My Chicago is the World article excerpted for V3con: V3 Digital Media Conference presented by AAJA-LA! The other night, my daughter crawled into my bed in the middle of the night. Completely asleep, I apparently shouted out, “Go away, stalker!” and “Did you come out of the computer?” Clearly, I have been doing a little too much social media lately. It is time to go to V3con and recharge. Hey, that's my picture in Rafu Shimpo! e, and to strategize further on how to push the pedal to the medal at full throttle,” said Lac Su, author of “I Love Yous Are for White People” and one of the original founders of the Banana bloggers conference in 2009. Speaking at the Media Decompression Collective's screening of Curtis Chin's Vincent Who? Tuesday August 21, 2012, in Toledo with Roland Hwang. Come join us! After the first incarnation of V3con, the Asian American and Pacific Islander (AAPI) digital media conference formerly known as Banana, my whole life changed. And I was not even there. 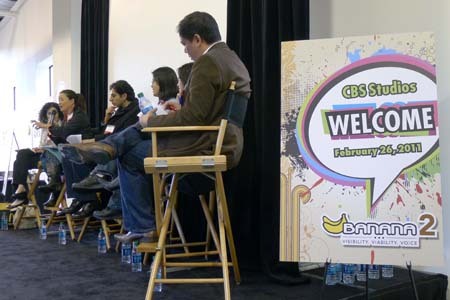 I learned about the Banana 1 conference the week after it occurred through my IMDiversity.com Asian American Village colleague Gil Asakawa’s posts recounting the incredible people he met, the amazing community that came together, the great fun they had. I was so sorry to have missed it, and I started following everyone Gil mentioned. Then Jeff Yang asked to friend me on Facebook, and I was soon invited into the virtual inner circle of our AAPI digital media community. There I found a safe space and invigorating energy where we could spread news, work through ideas, share our writing, and tell jokes with others who knew the same history, experience, and concerns. My writing began to take off. The 2012 Advancing Justice Conference website is up! See you in Chicago in September! A local film group will show “Vincent Who?” on Aug. 21 in remembrance of a Chinese-American man murdered in Detroit 30 years ago. Vincent Chin was beaten to death by Ronald Ebens, a Chrysler plant supervisor, and his stepson, Michael Nitz, after layoffs in the auto industry attributed to Japan’s success. The two were put on probation and received a $3,000 fine with no jail time. “This kind of stirred [Asian Americans] up and it started a movement that’s important to remember,” said Errol Lam, one of the organizers and a member of the Media Decompression Collective Toledo. V3con is happy to highlight the First 10 People to Register for the conference on August 24-25 in Los Angeles. Prominent blogger Frances Kai-Hwa Wang is one of our Top 10. She is a second-generation Chinese American from California who now divides her time between Michigan and the Big Island of Hawaii. She is a contributor for New America Media’s Ethnoblog, ChicagoistheWorld.org, PacificCitizen.org, and InCultureParent.com. 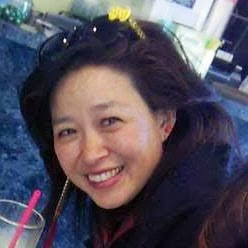 She was the arts and culture editor of IMDiversity.com Asian American Village for many years, and she now team-teaches Asian Pacific American History and the Law at the University of Michigan and University of Michigan Dearborn. Check out her two blogs RememberingVincentChin.com and franceskaihwawang.blogspot.com. So excited that cool Ryan Suda has invited me to be a part of Blacklava's 20th Anniversary Art Exhibition in Los Angeles next month! In the meantime, you can buy my chapbook of prose poetry and short short stories, "Imaginary Affairs--Postcards of an Imagined Life," online from Blacklava.net. Looks like we're up next on the Kerrytown Concert House homepage! See you Tuesday at 5pm! Only two more days! Jyoti Omi Chowdhury is picking up frames and I'm picking flowers today for Jyoti Omi Chowdhury and Frances Kai-Hwa Wang reception and reading for “Boots of Spanish Leather” photography exhibit in Ann Arbor, Michigan... hope i can get these through Agriculture! See y'all Tuesday, August 7, 5-7 pm, Kerrytown Concert House! I see in the Hawaii Tribune-Herald newspaper that novelist Lois-Ann Yamanaka is reading at the Kinoole Farmer’s Market. “Jean Yamanaka” is the contact name, so she must be in town visiting her mom or other relatives. I love her work and plan to go, excitedly gathering up all her novels to ask her to sign. But instead, the books bake in my car as I let myself get caught up with the older Japanese American ladies at the Jodo Shinshu Buddhist temple. I thought I could go to services 9-10 and then cut out quickly to go to the reading from 10-11:30, but there is no escaping the Aunties at temple. The first time we ever went to this temple, they ran out after us into the parking lot and physically pulled the kids out of the car one by one, insisting we stay for lunch. Sometimes I find myself categorizing our lives into “School,” “Sports,” “Music,” “Science,” “Arts,” and “Culture.” I want to make sure that we are living balanced lives, that I am exposing the children to a little of everything, so that they will grow up to be well-rounded, like the old Renaissance ideal. It is refreshing to be reminded that life is not always so easily categorized. Jyoti Omi Chowdhury and Frances Kai-Hwa Wang Opening and Reading promoted by parking lot? As live entertainment? Heritage Newspapers (A2Journal et al) calls us "Live Entertainment." Live, yes; entertaining, uh, hope so. :) funny to be listed in the middle of all those bars.